Two articles in this publication particularly caught my attention: Firstly, Hal Berghel’s cases both for and against the magazine moving from print to purely digital delivery (p. 76), together with his vision for a radical reform of “cyberpublication”, inspired me to look at the way in which I keep track of content that I have read, and to think about ways in which I could better make and retrieve notes related to this content. This resulted in me attempting to bring some order to the hotchpotch of notes that have been created in my OneNote over the years, and also to come up with a game plan for creating and filing new notes in the future. While my plans to embed hyperlinks to webpages and downloaded content that has been neatly filed in my One Drive work well for digital artefacts, there is some difficulty in providing traceability between this new digital repository and the physical books that I read. This is where the second article: Enabling the Internet of Things (p. 28) further stirred my imagination. In this piece, the authors provide a nice introduction to the technologies and strategies that are competing to become de facto standards in several key areas of the Internet of Things (IoT). This includes a description of three technologies that allow physical things to be connected to the IoT: near-field communication (NFC) tags, quick response (QR) codes and Bluetooth Low Energy (BLE) tags. Reading this introduction inspired me to create a printed bookmark containing a QR code linked to a digital note. Firstly I created a new note with the same title as my target book and attempted to obtain a web link to it. This was not actually possible using the current Windows Phone version of OneNote but was easily done using the version on my Windows 8.1 tablet. The format that Microsoft have chosen for the link itself however shows little foresight into future uses for this feature. The link includes the names of the notebook, the section and the note itself, meaning that if the note is renamed or moved later, the link will become broken. A better method would have been to provide a unique identifier for each note that is then decoupled from any user modifiable descriptions and locations. A quick search on Bing led me to several sites offering the free creation of QR codes. For no reason in particular I chose http://www.qrstuff.com/, which allowed me to paste in the URL for my note and then download the QR code as an image file. I then pasted this image into a bookmark and printed it out. Windows Phone comes with a built in QR code scanner known as Bing Vision which recognised the code without a problem. However rather frustratingly it is not possible to go directly to a note in the mobile version of the OneNote webpage, instead you are taken to the top level notebook and must then manually locate and open the note itself. Even when setting Internet Explorer to view desktop rather than mobile versions of webpages, this problem remained. Windows 8.1 does not come with a built in QR code scanner so I paid a visit to the Store in which there were several options available, some free and others priced for around £1.50. I opted for a free application called “QR Code Scanner 8” which, although having some very annoying quirks such as forcing the tablet into landscape view, did manage to do its job. Scanning the QR code opened the correct note in the browser version of OneNote, with the option of then opening it in the native application. 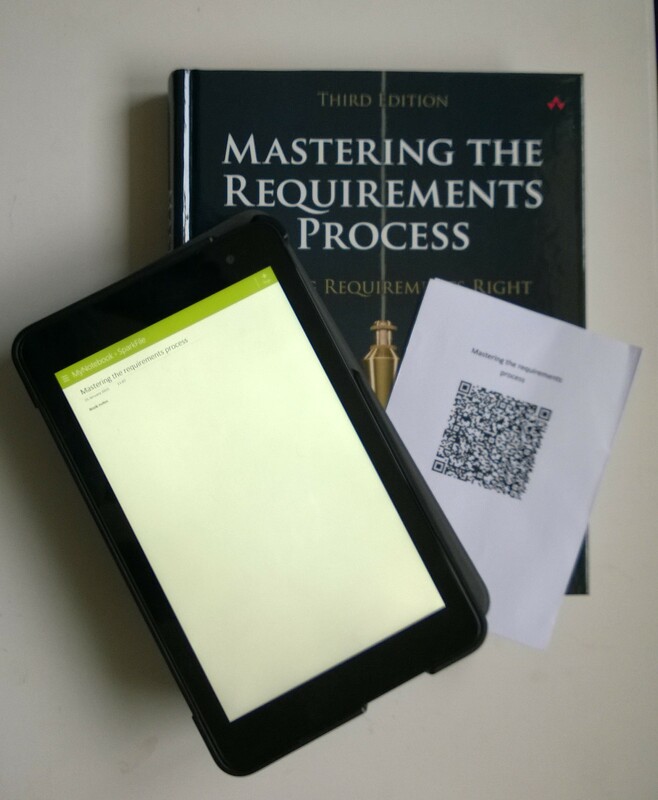 While I did manage to connect a physical book to my Internet of Things using a bookmark with embedded QR code, the process left a lot to be desired. Firstly, the fragmentation of Windows devices means that while some devices come with native features, such as built in QR code scanning functionality, others don’t. Furthermore two devices supposedly from the same family handle links to the OneNote web application completely differently. If there is such confusion between devices from the same manufacturer, I do not hold out much hope for interoperability between devices from different manufacturers. Secondly, and perhaps the biggest factor that will prevent me using this technology, is that it is tiresomely slow. Even with a relatively speedy connection, the OneNote web application takes several seconds to open. To add insult to this, the web application is only really acting as a “button” that launches the native OneNote program. Maybe a better solution to this problem would be to use a NFC tag to directly launch OneNote. However these tags must be purchased, where as the beauty of the QR code is that it can simply be printed. So it would appear that we are not quite prepared for the IoT just yet. While some tools and techniques are already available, the current implementations do not provide a seamless and pleasurable user experience. Next PostNext Good luck, and watch out for bugs!